40mm 18K rose gold case, transparent sapphire glass back, silver guilloché dial, automatic Elite 685 movement with hours and minutes, small second, date, power reserve, approximately 50 hours of power reserve, brown alligator leather strap with gold pin buckle. Water resistant to 5 ATM. 40mm 18K rose gold case, transparent sapphire glass back, rose gold bezel, silver dial with hour markers and hands faceted rose gold baton, automatic movement with hours and minutes in the center, subsidiary seconds, date aperture located at the 6 o'clock, approximately 50 hours of power reserve, rose gold bracelet, integrated clasp buckle. Water resistant to 50m (150 feet). 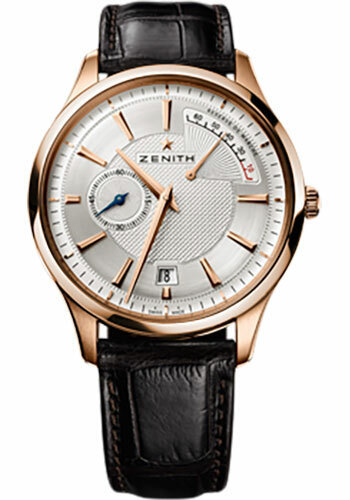 40mm rose gold case, 9.25mm thick, transparent sapphire glass back with oscillating weight, côtes de genève pattern, rose gold bezel, domed sapphire glass crystal with anti-reflection treatment on both sides, velvety silver-toned dial hour-markers and hands faceted, set with gold-plated or blued, elite 685 automatic movement with hours and minutes in the center, small seconds hand at 9 o'clock, power-reserve indication at 2 o'clock, date at 6 o'clock, approximately 50 hours of power reserve, brown alligator leather strap with protective rubber lining, rose gold pin buckle. Water resistant to 5 atm. 40mm 18K rose gold case set with diamonds, transparent sapphire glass back, silver guilloché dial, automatic Elite 685 movement with hours and minutes, small second, date, power reserve, approximately 50 hours of power reserve, brown alligator leather strap with gold pin buckle. Water resistant to 5 ATM.